Leveraging on our extensive market knowledge, we are providing a high-quality range ofTurned Part. 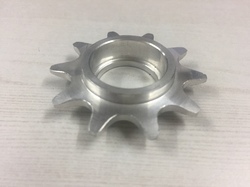 Owing to the huge amount of customer dealing expertise which we have proclaimed in our years of venture, our company has been genuinely engrossed in delivering a rich range of CNC Turned Components. We at Jagad Products, are involved in manufacturing and supply of best quality Aluminium Parts, that are precisely designed to perfection, accurate in dimension, these aluminum parts used in different industries all across the globe. SS, Al, Brass, Copper, Titanium Turned components up to 1000 mm length and 400mm dia. General Aluminum Turned parts as per customer's specifications are also available. we specialize in aluminum electrical connectors, Bushes Nuts Manifolds, Aluminume Conduit Fittings. 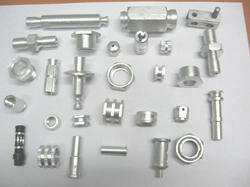 We are offering Aluminium Turned Parts to our clients. We hold expertise in offering a wide range of Aluminum Machined Parts. These are manufactured from top quality components which are sourced from reliable vendors of the industry. Demands of these products are increasing day by day owing to its unmatched quality, robustness and high functional efficiency.